This spring I’ve been bit twice while wrestling a cat. Compared to cats I’m slow and soft. My best successes wrangling cats have come from using my big brain to guide them to do what I want. When I figure out how to do that is less stressful for me and the cat. 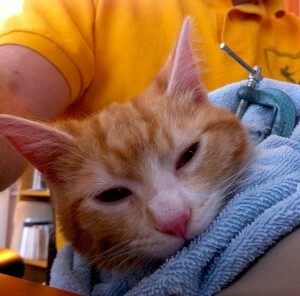 Our main role with Alley Cat Project is to hold cats for recovery from spay and neuter surgery. 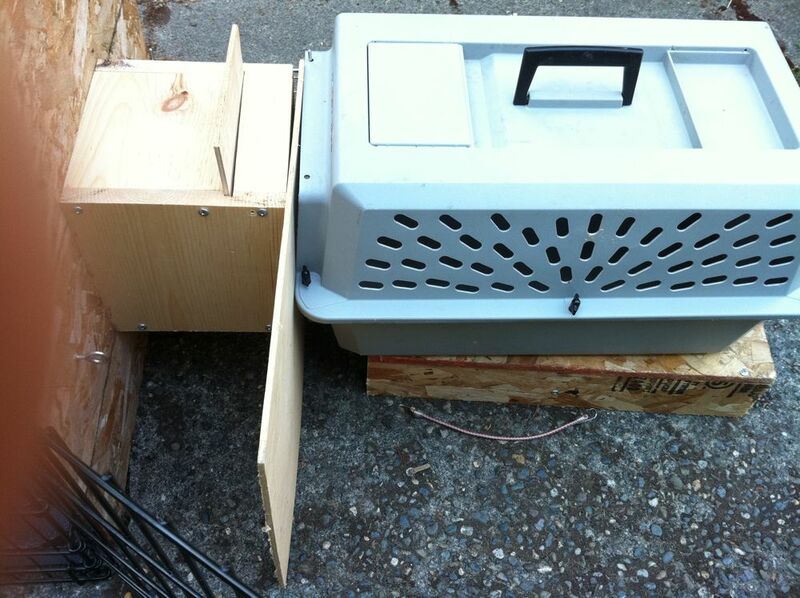 They come to us in a carrier and we put their carrier directly into a cage along with food, water, and litter. 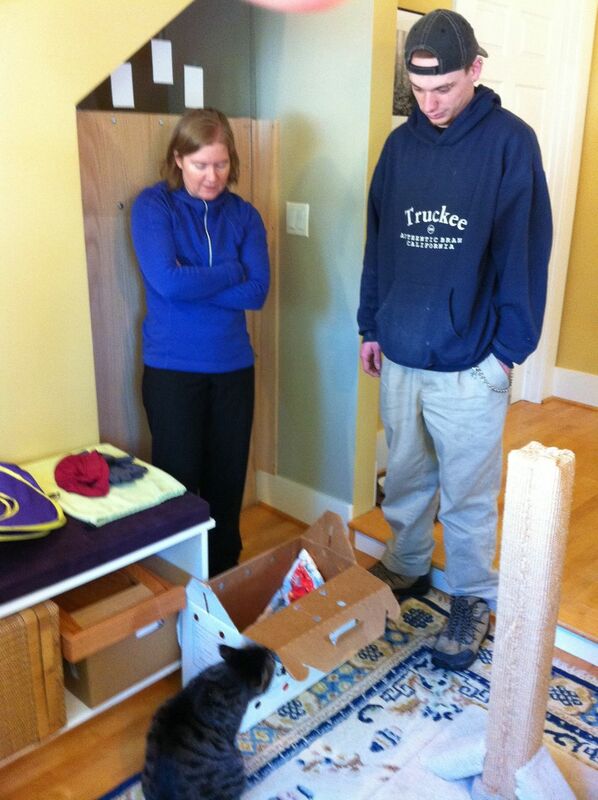 We open the carrier door and they have access to the necessities and a little room to move. When it comes time to release them we have to get them back into the carrier. 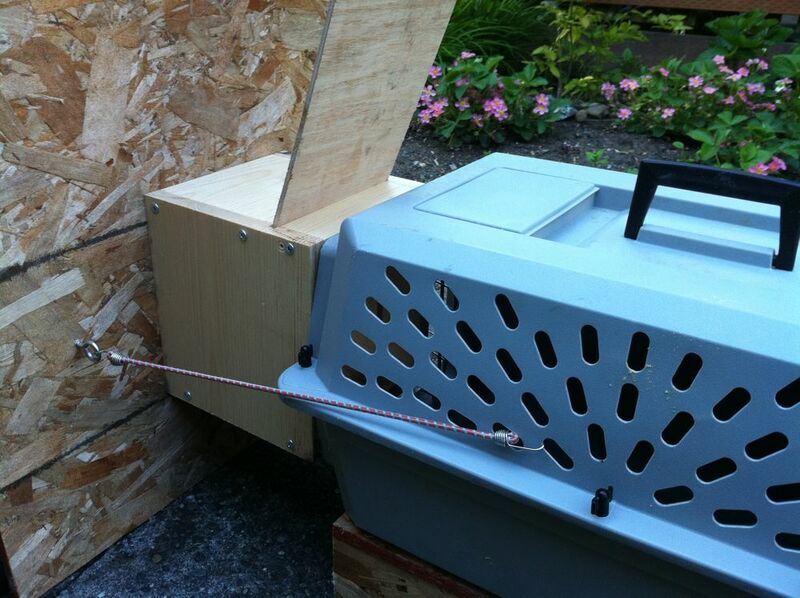 Most feral cats will seek out the shelter of the carrier, making the task easy. 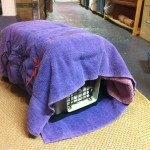 Recently, however, we have had a few cats who would not go back into the carrier and this has caused wrangling difficulties. I applied my brain to this problem and came up with the cage to carrier tunnel. The tunnel is mounted on a larger board which blocks the cage door. You open the door a smidge and slide the board in from the side. There is a point where you have to open the door wide enough to let a cat out but I think this can be done quickly enough to now allow escape. Tunnel completely covering the door. It can be held in place with bungies. 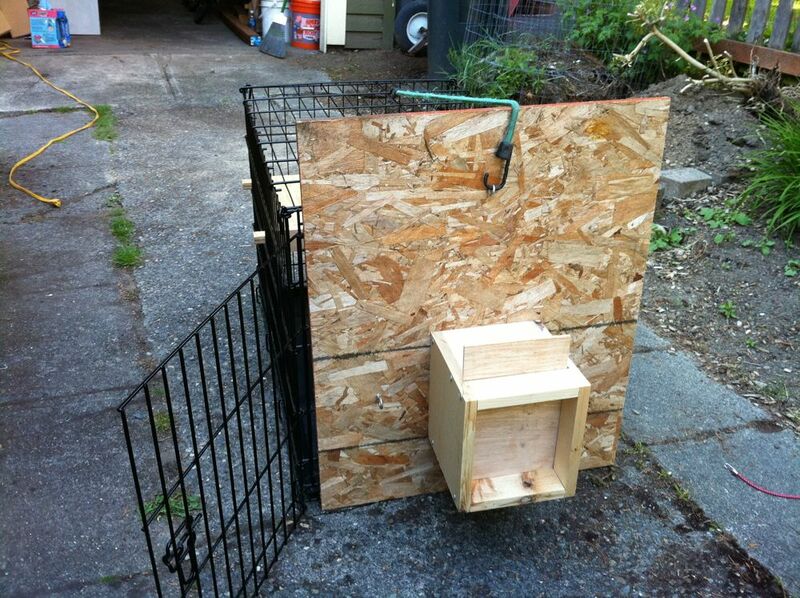 The tunnel has a sliding door to keep the cat in until a carrier is in place. I measured the doors of all the cages we have and tried to select a tunnel position that worked for all. The carrier can be bungied to the tunnel for one person operation. I’ll feel better doing this with two people, one holding the carrier, until we know how well it works. I hope the cats will see the open tunnel and carrier as a possible escape route. 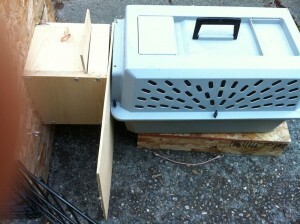 Once the cat enters the carrier the tunnel door is closed and a transfer board used to cover then close the carrier door. Hopefully it will work that well. In March we got a daddy cat from a family of cats in south Seattle. Now, a cat family is not like a human family. They don’t hang out together on the back lawn come evening. They did live in a colony and the care taker was fairly sure this fellow was the father of one or more litters. We had to hold him for a couple days before the clinic so I set him up in the garage. 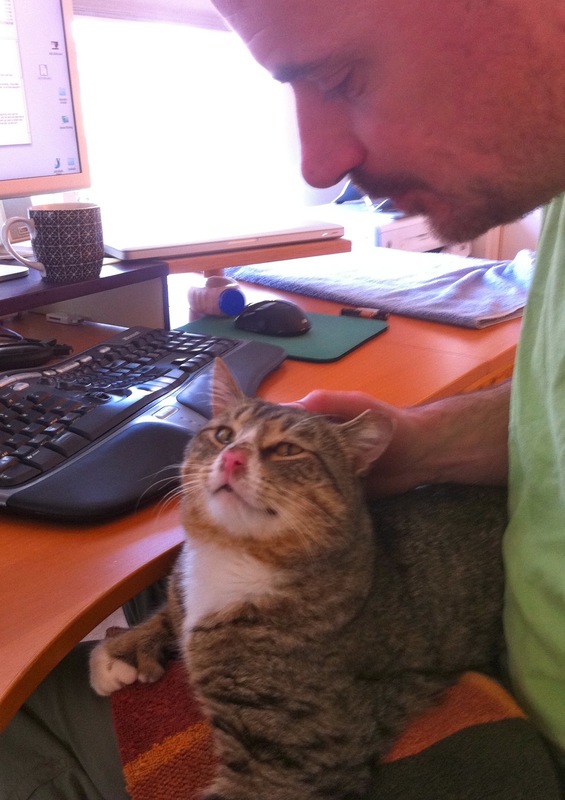 I always watch cats to see how they respond to me. 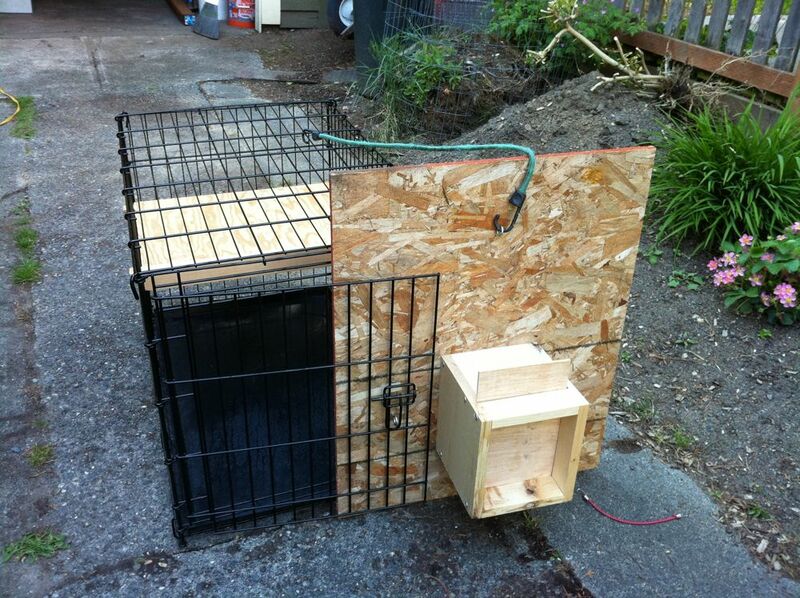 Some cats we trap are socialized to people. This guy didn’t run away from me like other cats but neither did he seem even halfway happy to see me. He had bad diarrhea, which can be due to the stress of being captured. On clinic day they called to say that he was very ill. 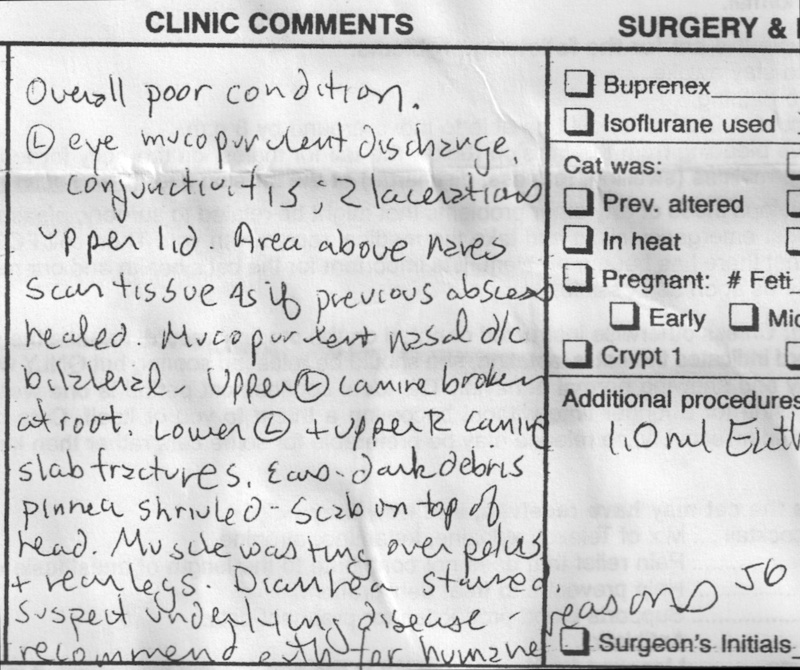 The clinic notes are below. He had several broken teeth, scars from previous fighting, muscle wasting, and other problems which suggested an underlying disease. The clinic suggested euthanasia for humane reasons. They thought if released outside he would die soon and it would be uncomfortable, even brutal. I consulted with Deb, but there is little we can do in these cases so we told the clinic to euthanatize him. I cleaned his cage well. 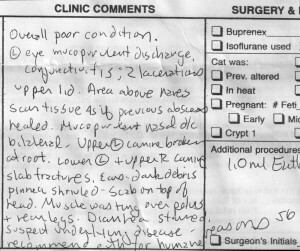 A week later I got back his medial record with the vet’s notes. That, and my memory were all that were left of his life. Many feral cats suffer uncomfortable deaths. Many animals suffer uncomfortable deaths. Many people suffer uncomfortable deaths. It is one of our sufferings. 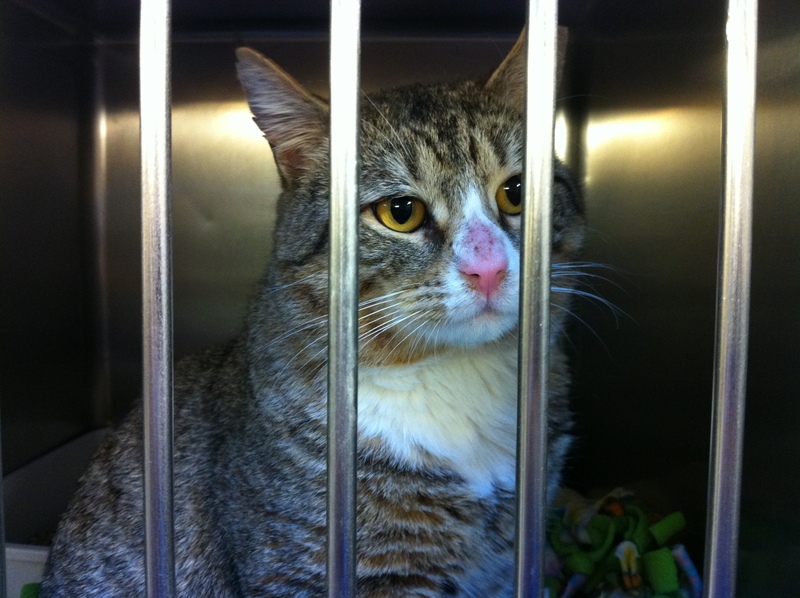 We work to help feral cats because we have an affinity for cats, but we also see how limited our help can be. Once a month our temple makes prayers for the deceased and Marie and I go whenever we are in town. Our group recently got a box of free microchips from HomeAgain. Kate and I injected chips into two ferals. She had me try the second one but I didn’t get it in. Yesterday Deb helped me inject a chip into another feral. Success. 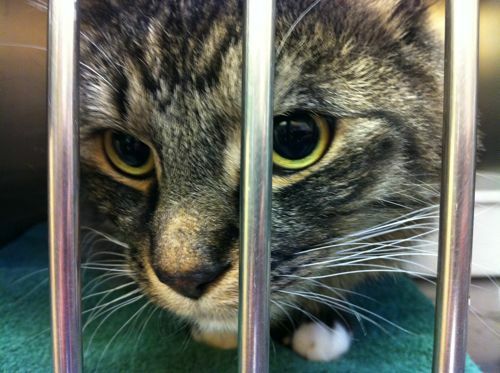 All shelters put microchips into cats they adopt out. All shelters also scan stray pets for chips. The chips have a number. The number leads back to the chip company which keeps a record of pet owners. This is a great system, in theory. In practice there are a few flaws. But overall it does work. 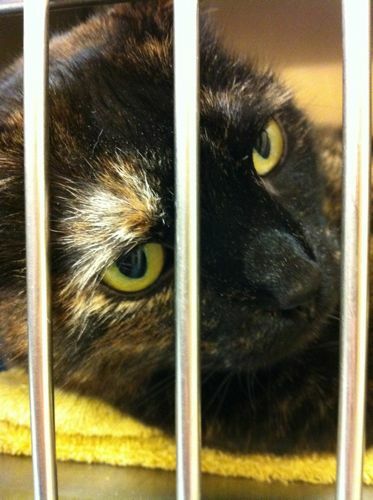 Last month the clinic found a chip in one of our cats and got her back to her people. She had been lost for 3 months. Registering with the company that made the chip. Registering with another company may prevent your contact information from being found. Updating your contact information when it changes. Lost dogs usually get picked up with in days. Lost cats can take months to be picked up. We don’t see free roaming dogs in the city but we see lots of free roaming cats, many without collars. Most are from a nearby house and are not lost. Some are lost. It is just hard to tell which is which. 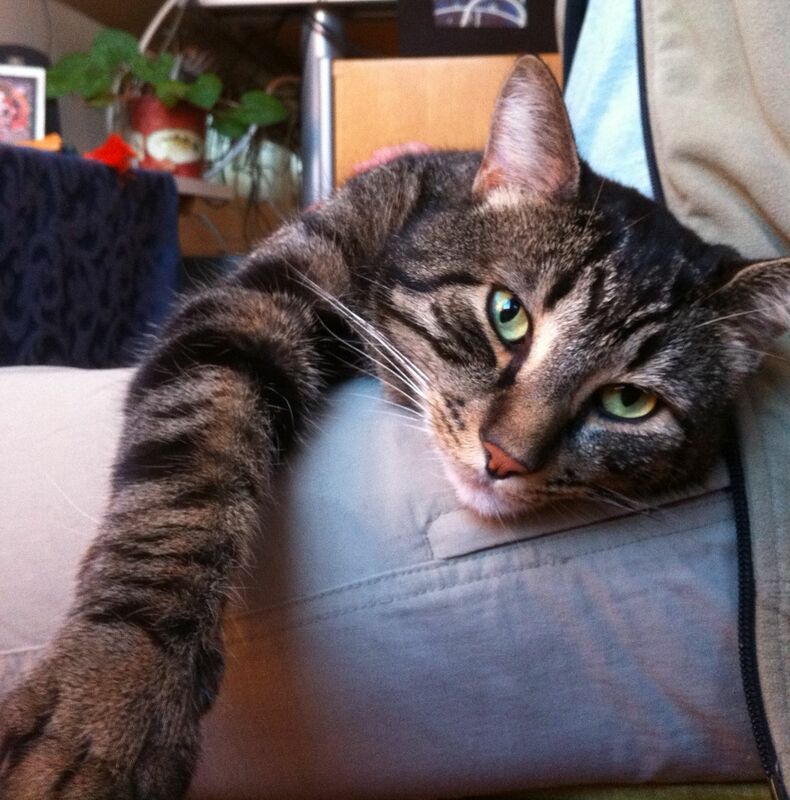 Here are some things you can do to help get lost cats back to their homes. If you let your cat roam outside put a collar on it. The collar should have your phone and address. The collar will show the cat is owned. The address will let people decide if the cat is lost. The phone number will let them contact you. All cat collars should be escapable in case they get hung up. A good collar costs under $10. 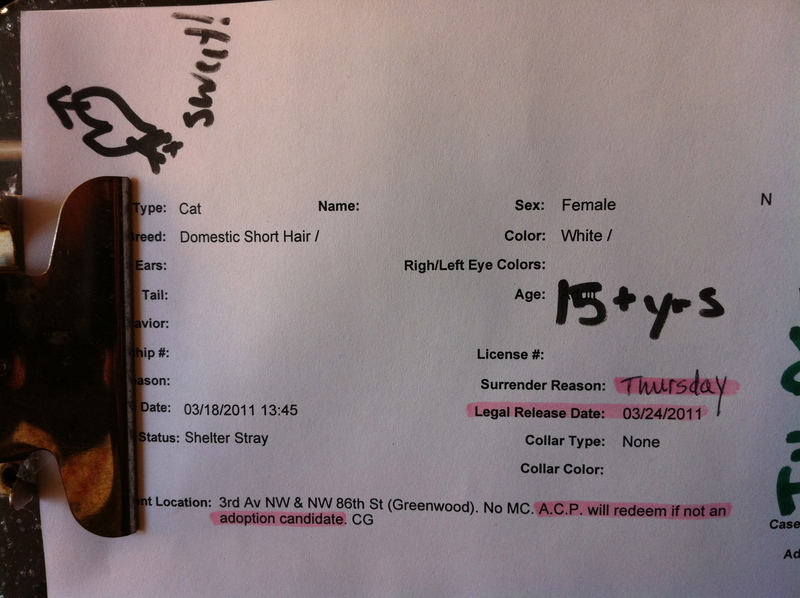 If you see a cat with a collar check the address. If it is not near call the owners. If you see a friendly cat with out a collar, try to find the owner. Ask your neighbors. Put a collar on the cat with a note to call you (this works!). Take it to a vet or shelter to be scanned. Scared cats are not always feral. Many lost cats are scared and hide. You can’t distinguish them from feral. If you see a scared cat repeatedly contact a cat rescue group. (The group we work with, Alley Cat Project, covers Seattle). 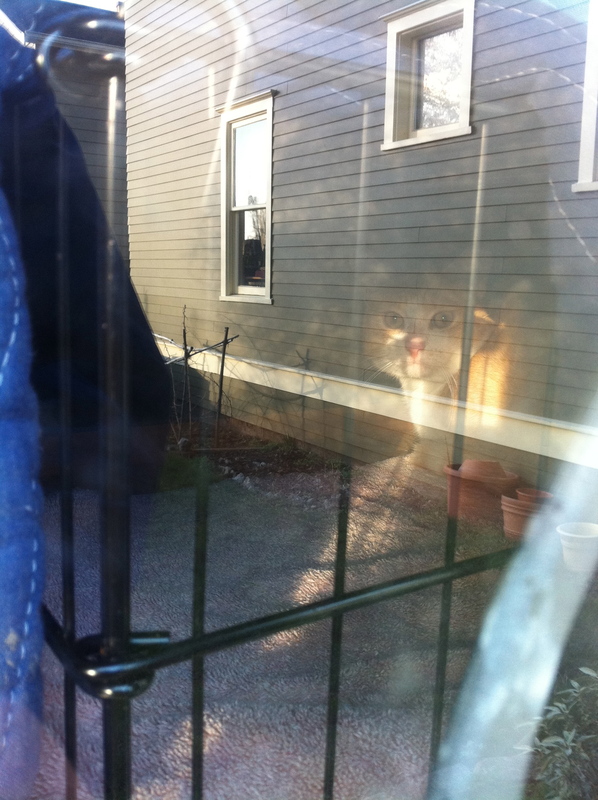 You can consider any cat whose owner can’t be found through these methods to be unowned. If they are friendly it is time to find them a new home. Steps 3 and 4 are not easy, which is why so few lost cats without collars are returned to their owners and those that are can take months. If you do take the time to help un-collard cats you see you may help neuter a feral, find a friendly cat a good home, or return a lost cat to their owners. 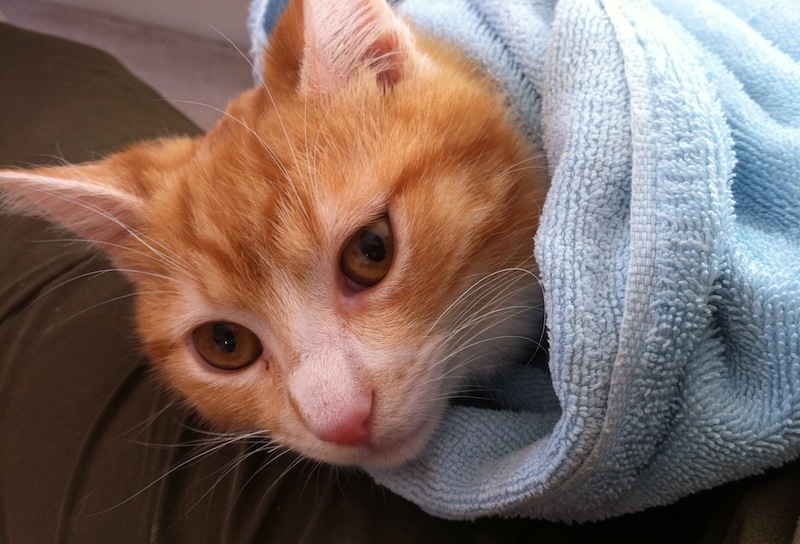 One technique for socializing feral kittens is to wrap them up in a towel so you can hold them close and they can not escape or scratch. They look rather like a buritto so it is called burittoing. Marie and I also call it snoggling. It took me several cats to figure out how to do this effectively. Initially they would escape out the front or the back. Even well wrapped I had to hold the towel snug around their neck to keep it secure. 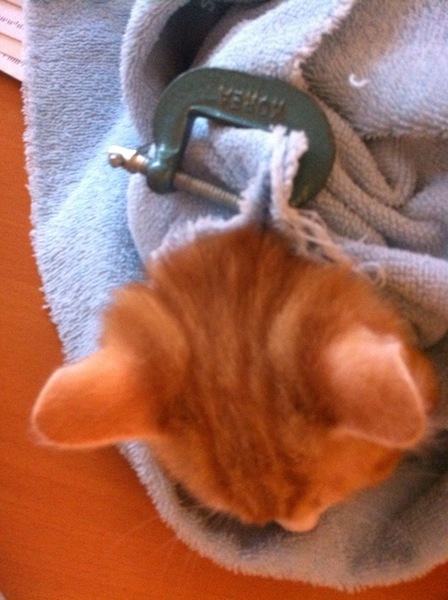 I’ve finally figured out how to make a secure buritto so I can snoggle a cat while working. Here’s what I do. Select the right towel. It should be wide enough to leave 6 inches towel at head and rear and long enough to wrap at least twice around. It should also be fairly thin so you can scruff through it and the final burrito is not too thick. The towel I’m using is 26″ x 48″. Have the kitten in a confined space. Chasing them around only enforces their feral behavior. Advice I’ve received is to keep them confined until you can approach and pick them up with out a chase. Approach with the towel and put it over the kitten. Winnie still hisses when I approach but as soon as I get the towel over him he stops hissing. Eventually I should be able to pick him up with out the towel but last time I did that he fought fiercely reenforcing unwanted behavior. Scruff him through the towel. This is why you need a thin towel. Pull him out with the scruff and support through the towel. Winnie still goes passive when scruffed so this is quite easy. Wrap him up. If you positioned the towel well you’ll be holding his scruff through the towel such that he is near one end and centered. Holding this scruff I wrap the towel under him, set him down, spread out the towel, wrap it over, wrap it under again, and back over. Hard to explain exactly but you’ll figure out a sequence that gets him all wrapped up. Recently he starts purring at about this point. I then peel back the layers around his head. Be careful as this is when they may try to escape. I identify one wrap that I can snug around his neck and then pin this securely with a clip. I’m using a small clamp (see photo) because it can be very secure. Things like clothespins are not secure enough. Wrapped up like this I can now rest him in my lap and don’t have to hold the towel to keep him from escaping. 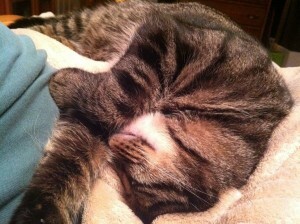 Now that we have done several sessions of this he generally relaxes, purrs, and sleeps. Update: After about a week of burritoing Winnie I decided that it was not providing enough benefit to justify Winnie’s discomfort at being kept in a cage and forced human contact. Now Winnie is running wild in our upstairs and keeping his distance. Maybe in his own time, and with the example of elder cats he will come to enjoy our company. 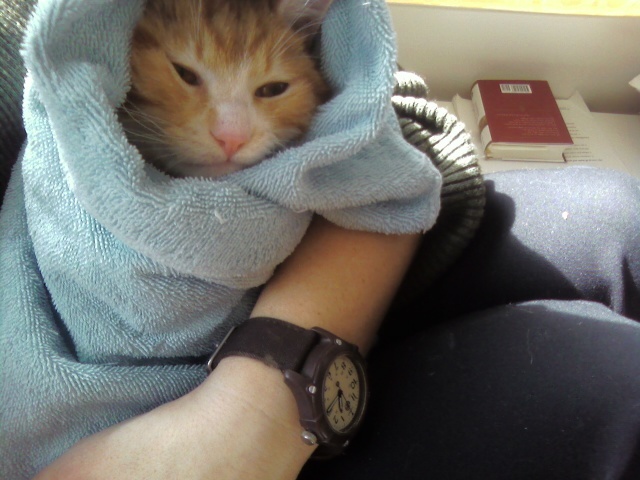 Burritoing may work for some cats but perhaps not for Winnie just now. Odel and Winnie came to our house on February 18. 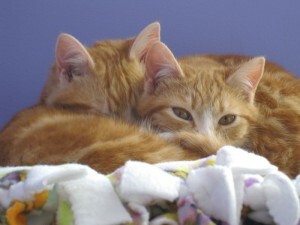 Captured as ferals and already over 12 weeks old, they would prove to be a challenge to socialize. 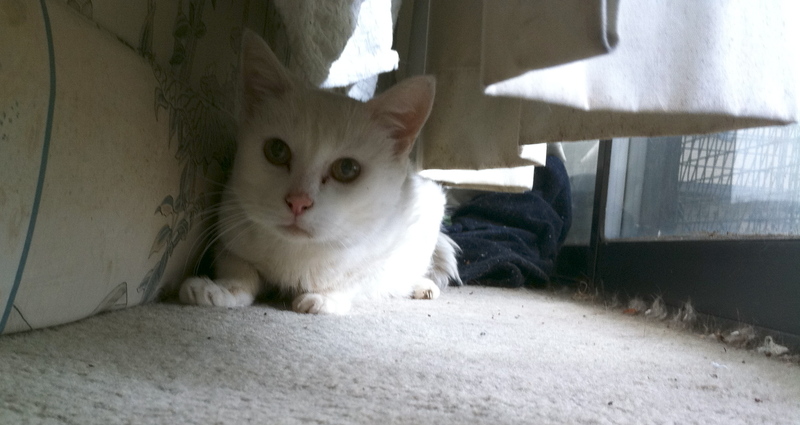 But after nearly two months indoors, they have been well fed, altered, and endured lots of human contact. When they first showed up, they just wanted to hide and hiss every time either of us came into their room. 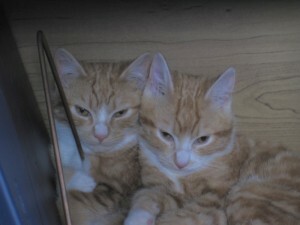 They often would take refuge behind my books in the bookcase. I would take the books out one at a time to see them pressed up against the wall, giving me the serious stink eye. They continued to hiss and spit at us almost every time we came near them. 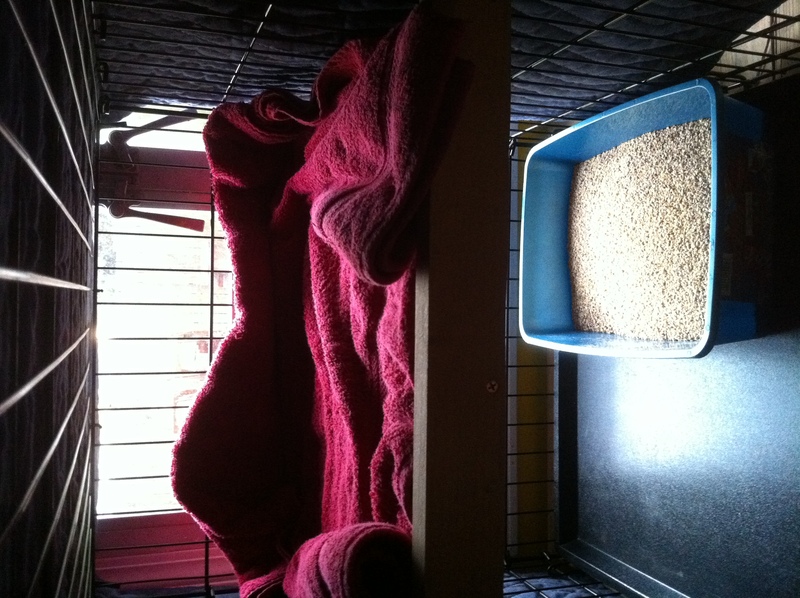 We kept a large cage on the day bed with open doors where they could always run to feel safer. Also, that’s where we fed them so they learned to run into the cage for meals. Inside the cage was a small cubby where they could hide for extra security. 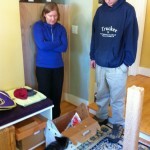 After a while we removed the cubby, forcing them to be out in the open more. They became more comfortable outside the cage and would often snuggle on the pedastle near the window. 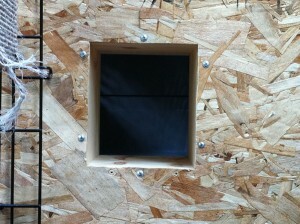 In March we had three windows in their room replaced. A very traumatic week for them with all the banging and movement. Once the room was back in order, we removed the cage. After the clinic, we separated them so they can become more bonded with people rather than continue to cling to each other. 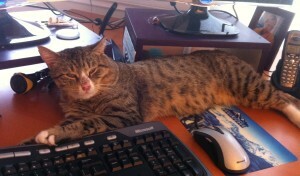 Winnie has taken up residence in Tom’s office while Odel keeps me company in my office during the day. I’m sure they miss each other, and we look forward to letting them play together in the future. We spend time each day holding the kits in a burrito to help them get used to us. They love to run and romp. They both have climbing posts and toys. They both quickly developed great litter box habits, but Winnie has a way of kicking an amazing amount of litter out each time he uses it. 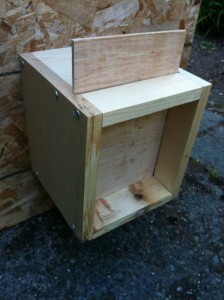 Although we’ve heard many cats don’t like these, a covered litter box may be the ultimate solution for him. Their personalities are distinct, with Winnie being much more relaxed in general while maintaining his physical independence, while Odel is more intense, fiercely standing his ground when threatened, but who mainly is scared and just wants to be loved. Both prefer the company of humans to being alone. Even as I write this Odel is tearing around the room with his mouse toy, jumping over my legs and purring whenever I talk to him. 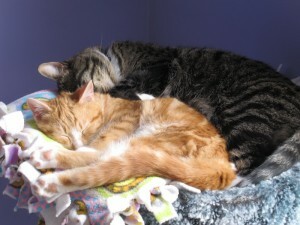 Coming from a feral background, both kittens also love the company of other cats. 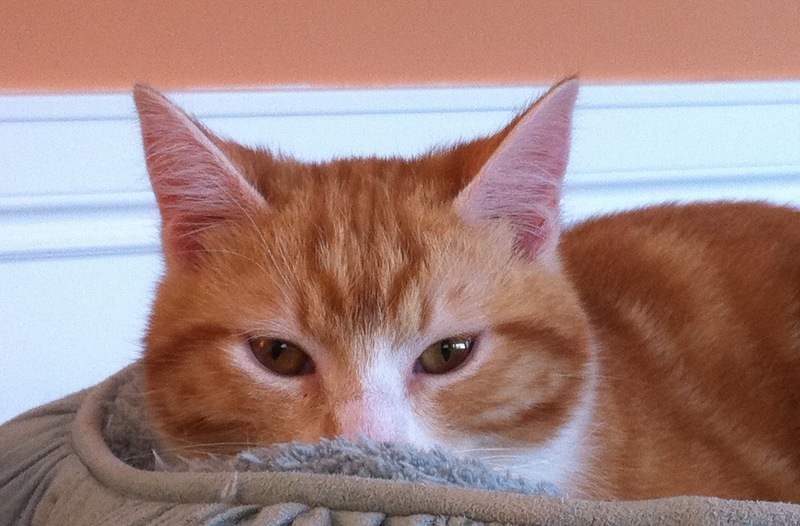 There’s lots of purring and following our resident boy, Nelson, when we let him into their rooms. These boys would make excellent companions to a household with some feral experience. Winnie still does not and may never like to be held. He no longer hisses when you come into his room, but he will run away if you get too close. Still, his trills and play antics are a joy to be around, especially if he has his play companion, Odel, or other cats to romp with. 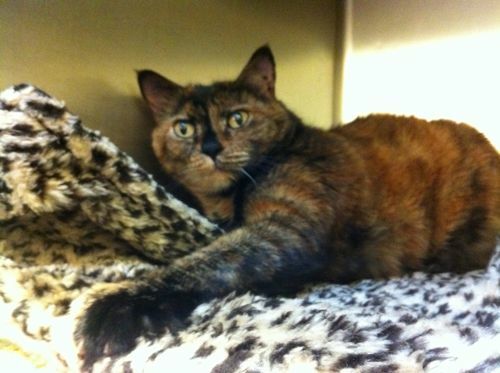 Odel does not prefer to be picked up, but once snuggled in your arms wrapped in a blanket, he will relax and purr contentedly. But, he may not choose to stay long, especially if he’s in play mode. 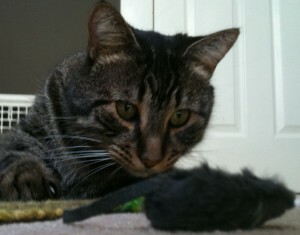 Both kitties love to play with toys on a string, mice, ball in a doughnut, and undercover mouse. I suspect, with patience, Odel will become more and more affectionate towards people while Winnie will always be curious but is likely to maintain his physical independence. These beautiful boys would do great in a stable home with lots of room to play where there is little expectation for them ever being lap cats. They will continue to need socializing for a while and may not yet be ready for roaming freely in a large house. 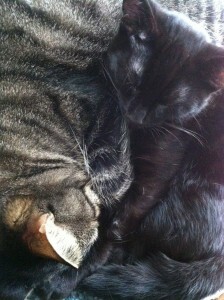 But as time goes on, I suspect their affection will grow as they feel more secure and settle into their forever home. flyer to post in pet stores. Winnie with our crazy resident cat Nelson. Update: Both these cats have gone to great homes! Thursday night I trapped a cat. Back home I visited with her in the carrier and determined she was tame. 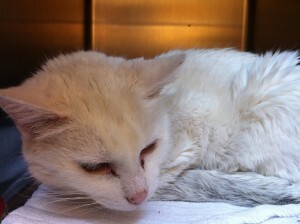 She has a beautiful white coat with a hint of grey down her spine and a dusty grey tail. Her coat was dirty and she was very, very skinny. 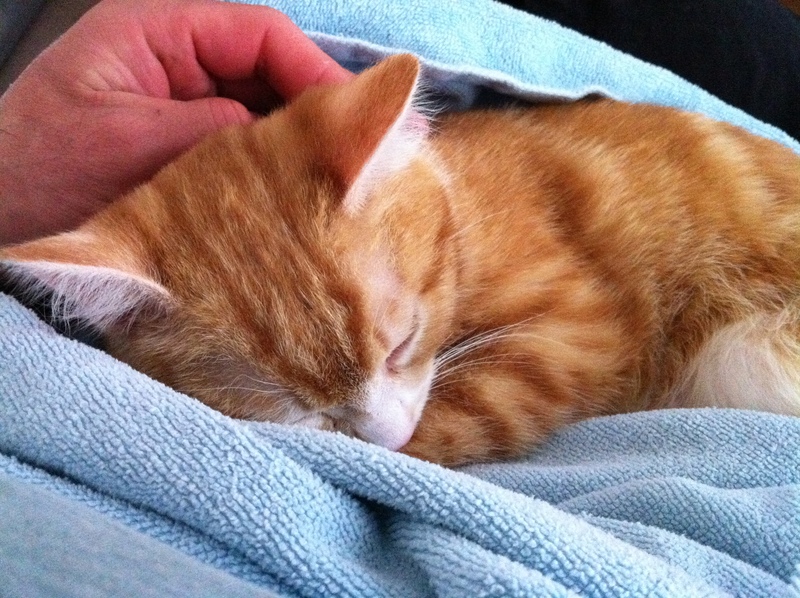 Tame cats who get lost or abandoned don’t know how to take care of themselves. Lost tame cats are the underfed dirty looking cats. Feral cats, by contrast, do know how to take care of themselves and they can look pretty good, as long as they are healthy. I set her up in our display cage. I’m building inserts for this so cats have several levels on which to perch and the messy litter can be kept on the bottom layer. With out these cats, litter, and food are all on the bottom and that is not how cats want to live. When I opened the carrier door she jumped down to the floor and hunkered down. She was just slightly receptive to pets. Clearly socialized to people but in shock from her recent experience. To be so skinny she must have been out on the street for a month. To go from a pampered life as a companion to living on the stree must be scarry and confusing. With the comfort of some pets she went over and ate the food that she had previously just sniffed at. 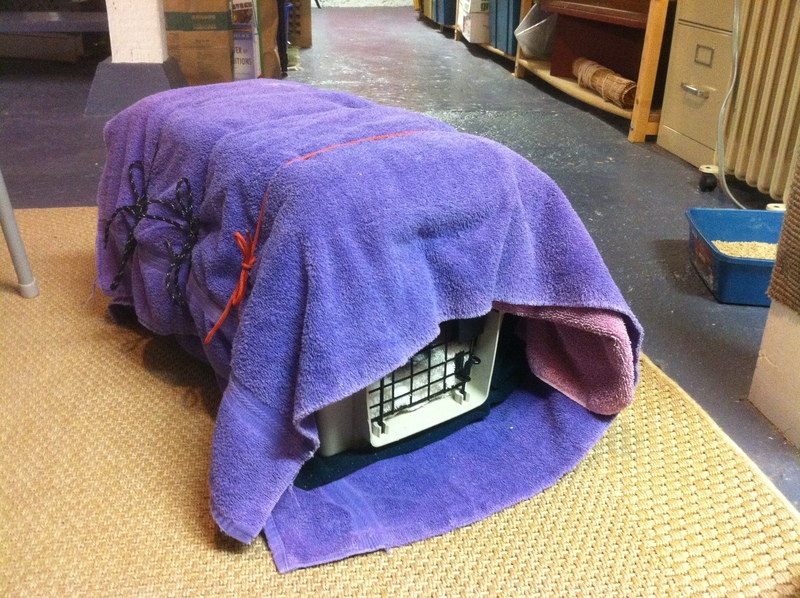 She did not seem inclined to climb back up to her carrier or the cubby so I put a snuggly wool cloth down on the floor for her, covered over the cage, and let her have a quite, warm, dry night. In the morning I found that she had regurgitated her whole meal. I had encouraged her to eat too much food at one time. I cleaned everything up and gave her some more food. I pet her more and found her slightly more relaxed. She purred. I brushed out her coat. Later that morning I said Medicine Buddha prayers, concentrating specially on her. 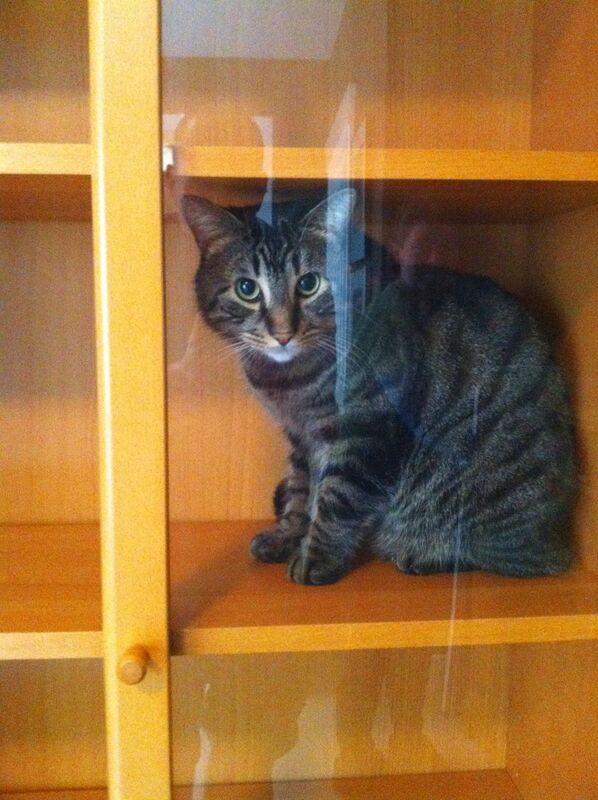 When I came down again she had eaten all her food and climbed up to the cubby. I pet her in there and she purred then kept purring after I stopped. I gave her another small portion of food, which she ate. She was happy to be inside a relaxing a little. Early afternoon I bundled her into her carrier and took her down to the Seattle Animal Shelter. Within a couple minuts of sitting down with officer Corry she was vaccinated, given wormer, treated for fleas, and scanned for a microchip (none). He took her to the back where she’ll be fed and fussed over by volunteers. 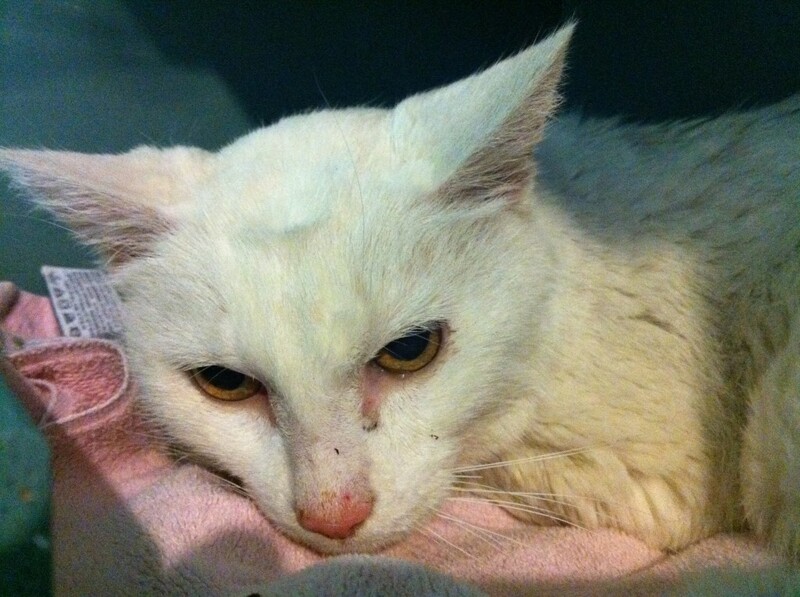 In a couple days I hope she’ll be transfered to a foster home for some indoor TLC. Her way of snuggling into my hand reminded me of Luna. 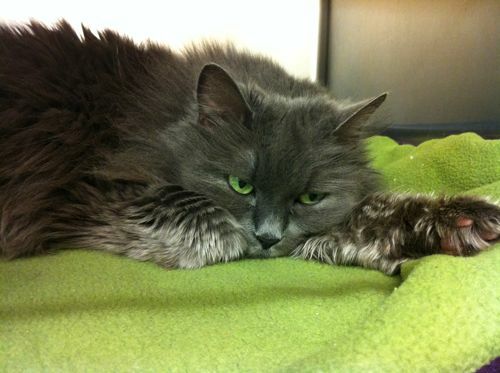 Luna came to us underweight, half her coat licked off, and somewhat is shock from some recent experience. Now she is pamperd daily. Hopefully the White Lady will soon have a happy, pampered existence. 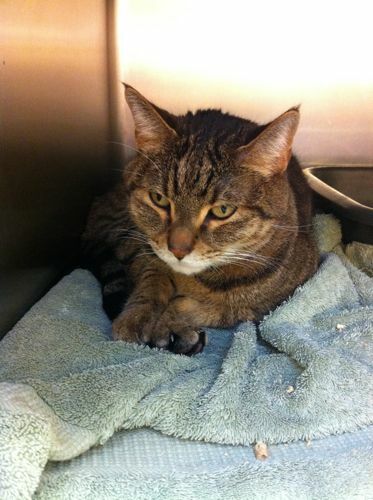 The Seattle Animal Shelter said she was “ancient”, may be developing kidney disease, and not a candidate for adoption. We gave some thought to adopting her ourselves. 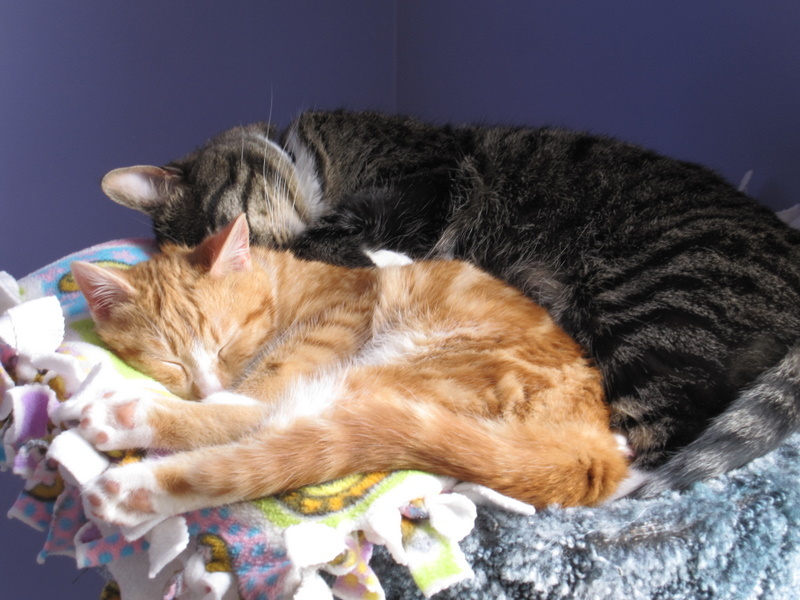 Nelson and Luna were returning to a happy two cat society – we hated to risk upsetting that. But if the alternative for her was euthanasia we might. Fortunately, the woman feeding her where she was trapped volunteered to take her in. At the shelter I saw that someone had written “sweet” on the cage card. In addition to the vaccinations and flea treatment the shelter also did FIV/FeLV tests (negative) and microchipped her. 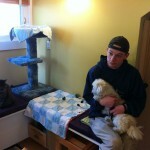 This is a great facility and the people at the shleter are working hard to help animals in their care. Today the White Lady goes a good home. White Lady in her new home. Jojo was our third cat, and he surprised us. To explain how I have to tell his story. We got Jojo as a foster transfer. 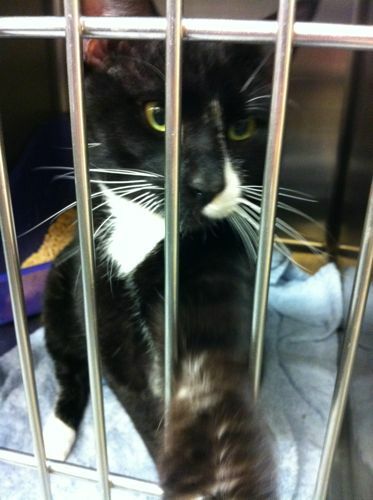 Another Seattle Animal Shelter foster family was asking for someone to take Jojo as he was harassing their elder cat. We were looking for a buddy for Nelson and thought that could be Jojo so we took him in as a foster. Right off he intimidated us. He growled at our other cats through the door and growled at us. Physically he is a robust cat and we were wary of him. We thought he might eat little Nelson for lunch. 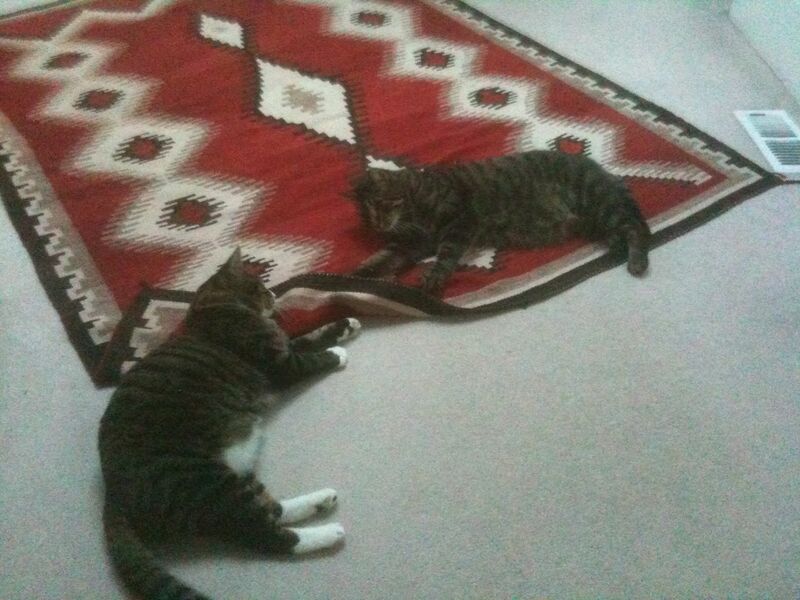 Jojo does not weigh more than one pound more than Nelson, but he just looks bigger. The introduction to Luna and Nelson was slow but eventually they were all together. Soon Nelson and Jojo were play buddies. We saw an edge of aggression in Nelson’s play with Jojo but we figured that Jojo could stand up to that and otherwise things looked good so we adopted Jojo. We now had three cats. However, neither Marie or I felt a strong bond to Jojo. 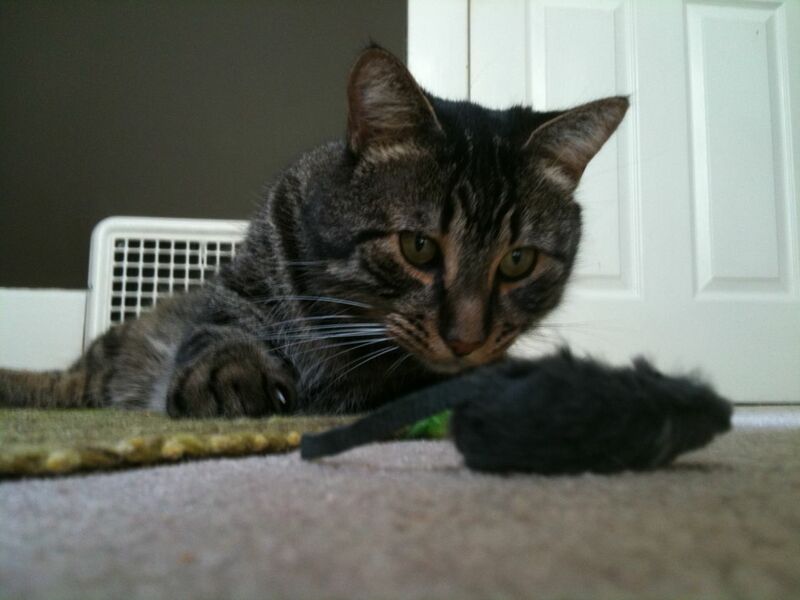 He seemed primarily interested in play with toys and other cats. He did not display much affection toward us. 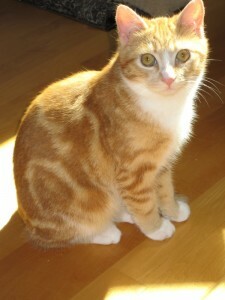 But, he needed a home, he was difficult to adopt, and he fit in with our other cats. We could give him a good home. We continued fostering and took in kittens Maxwell, Sabine, and Blanca. Sometime during this the relationship between our residents soured. Nelson started attacking Jojo and became less happy in general. Jojo, in turn, got more play aggressive with Luna. Soon we were isolating Jojo from Luna and Nelson. To keep Jojo company we kept Maxwell with them – they were good buddies. But they would spend most of the day in Marie’s office. Nights we gave them run of the downstairs. Max, however, would usually slip past the side of our barrier to join us upstairs, leaving Jojo by himself. We thought that Max could be the cause of Nelson’s aggression so in August we redoubled our efforts and soon found a good home. It did not solve the problem. Worse, Jojo was by himself most of the time. Out of sympathy, Marie or I would sleep in the downstairs bedroom to keep him company. This is when he surprised us: he turned out to be great company. Jojo is a really sweet cat. He likes to be with us and is interested in what we are doing, loves head rubs and play time, and sometimes crawls into our laps. He is not exceedingly affectionate but very interested, interactive, and self-reliant. A great companion. We both came to feel a much stronger connection with Jojo so we increased our efforts to re-introduce him and Nelson. In September We hired a can behaviorist who offered a lot of good suggestions. Her program was to give Nelson a reason to like Jojo through positive association with food, treats, and play time. 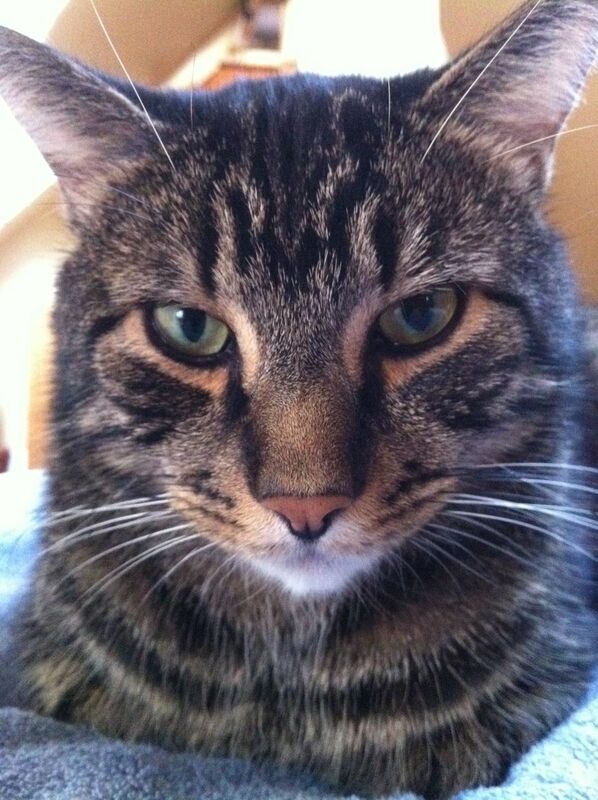 When that alone did not work we gave Nelson kitty prozac. When that did not work in January 2011 we added another anti anxiety drug. By the end of January we admitted that it was not going to work and it was time to find Jojo a new home. 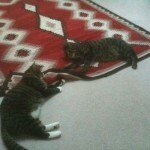 I made a web page [link], a petfinder.com listing, and kept Craig’s list postings up to date. After a week a nice couple from Everett contacted us. They seemed cat savvy and willing to have patience with Jojo’s slow adaptation to new situations. They didn’t have any cats but did have a little dog. Jojo and dogs were a complete unknown. We wanted to give Jojo a good home but could not. We could at least feed him the best food we knew and keep him company as best as we were able but once we adopt him out we would give up control of that. I would like to explain all this to Jojo – why his whole world is about to change – but can’t. This is a time of feeling my limits but still trying to do the best for Jojo. When we met the couple we liked them. 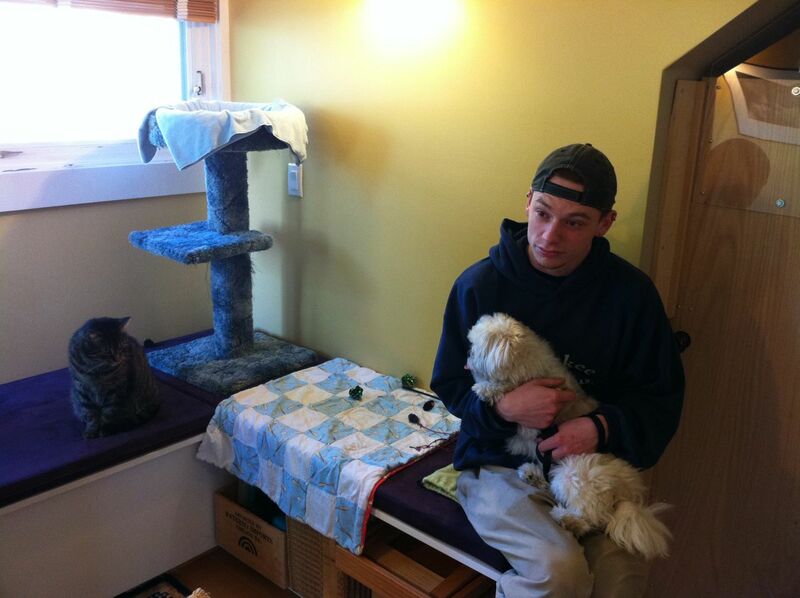 They appreciated both cats and dogs and the different type of companionship each provides. They liked who Jojo was. Jojo seemed to like them. The only question was would Jojo like the dog, Teddy. 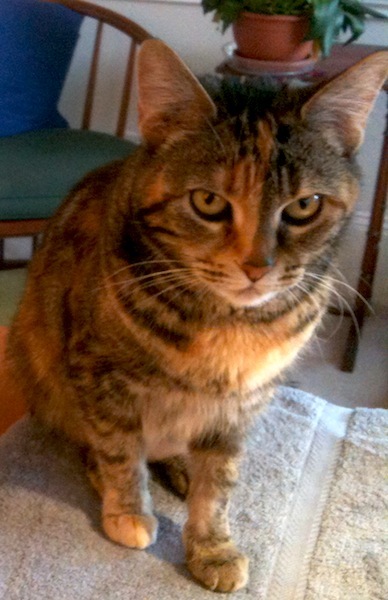 Jojo’s standard response to a new cat is to hiss, growl, and run away or swat at them. We have introduced him to a lot of kittens and this has been his initial reaction to all of them, even Button, Ambassador to Cats. Jojo gets over it but it takes about 2 weeks. I thought if we got a similar reaction to the dog that was a good sign. Back up, tail fat, full attack mode would be a contra indication. Well, Jojo walked right up and sniffed Teddy’s nose. No growl, no hiss. He did lift his paw as if he was thinking of batting Teddy but then set it back down. He was interested and calm. Somehow dogs are in a different category – somewhere between cats and people. We all thought it could be a good match. So we got their carrier, said last good byes, and away Jojo went. I find myself wondering: how is he doing? Is he scared? Is he interested? What is he experiencing? Why don’t he write? That is just it. I would love to hear from Jojo himself – but I never will. Jojo is fitting in well. We kept him in the bedroom the first night so hecould get used to his surrounding and our smell without the dog botheringhim. When we let him out he looked around a bit and came right back tothe bedroom. He sits in the window during the days and lays in bed withus at night. We are glad to have a new companion and teddy seems happy to have a new friend. This is inevitable and we are ultimately unable to protect others or ourselves from these experiences. 4/28/11 Update: We got an update! Sorry for the lack of email we have been out of internet for a while. even get along well with the two year old up stairs. bathroom keeping an eye on our guinue pigs and hamster. feed him at 3. So of course the pets now all eat at 3.
content in there so we do not push it. While visiting Griz I checked out some of the other cats at the Shelter. There are lots of great cats there right now. From a horder. A little shy but friendly and soft fur. Note If you are Griz’s adopter we would love to hear where he ended up. Griz was picked up as a feral cat by the Seattle Animal Shelter, pass to us, neutered and ear-tipped at the Feral Cat Spay/Neuter Project. As he was recovering in our basement I noticed that he did not seem as scared of me as a fully feral cat would so I started working with him. Two days latter he would come to the front of the cage to greet me, rolled on the floor as I pet him, and complained when I left him. I soon moved him up to my office where he prefers to hang out near me, sometimes in my lap. He clearly has lived with people in the past and somehow got separated from human society for a while. I named him Griz because his head was about as big as a grizzly bear’s. 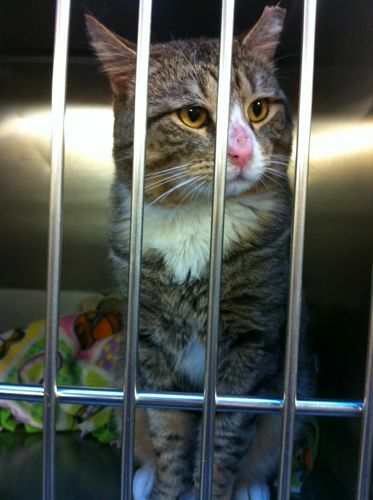 That and he looked a little grizzled: hair rubbed off nose from when he was trapped, scar on head, missing tail, tipped ear. Good food, daily brushing, and lots of affection have cleaned him up considerably. He is super affectionate, loving head, ear, chin rubs, and good back scratches. 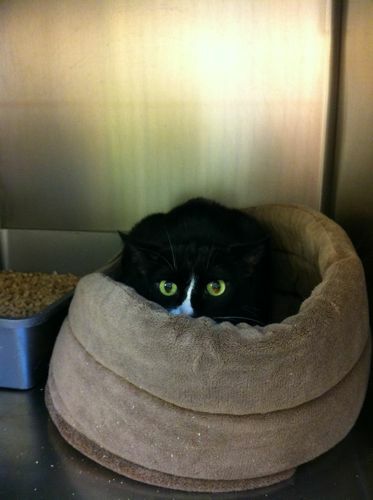 He likes human company and would do well in a house where people are around. He is athletic and explorative. I didn’t expose him to other cats but think it likely he would get along with them. Good litter box habits. If you are the lucky adopter of Griz we would love to hear where he ended up. Pleas write via our feed back form. Update: I visited Griz at the shelter a week after he was checked in. He is doing well and likes head rubs as much as ever. 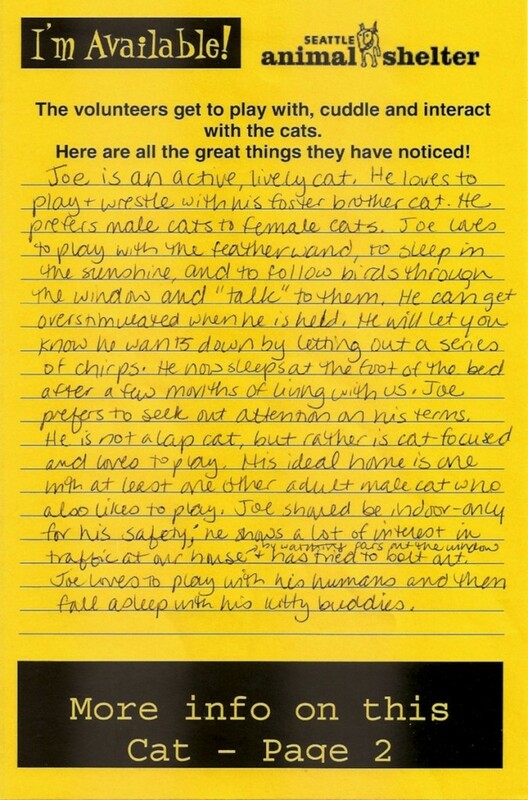 I wrote on his cage card under “Special Needs” the text “Head rubs, lots of head rubs”. We have a feral male who we call “The Magician”. Every time we bring him a plate of food, when we next check back he has made it disappear. This is common for true feral cats – those with out any human care takers feeding them. When food is put down in front of them they eat it. Insulated carrier to keep the Magician warm. He is also the first cat we had who knows what to do with a chicken neck. These were recommended to us as a way to keep our resident cat’s teeth clean. They have whole bones and chewing up the bones helps clean the teeth. Our residents don’t know what to do with them but the magician does – he makes them disappear. Another sign that he has probably been catching his own food. Cats who live outside develop a thicker coat for cold weather. They will loose the coat if they are inside for too long so I moved him out to the garage. 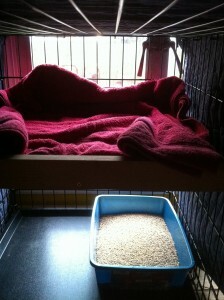 Gave him a well insulated carrier to snuggle in and a shelf with a view out to our back yard. 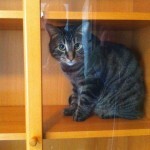 For the first several days I think he mainly stayed in the carrier but recently I’ve seen him on the shelf. Today he goes to a barn home.